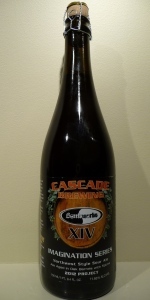 Graciouly brought to a recent bottle share in PDX (alas, I cannot recall who brought it). The beer pours a gold amber orange color with good head retention and lacing. The nose is interesting and attractive. There's some noticeable fruit and vanilla, but you also pick up a light wine and rum component that is intriguing as well. On the palate, the sour component dominates, but there's enough wine and sweet citrus to counter and balance that sweetness. It really gives the beer a delightful "sweet tart" flavor that is very nice. Mouthfeel is medium bodied to full, with a long sweet tart and vanilla finish. The beer is very light on it's feet, and drinkability is exceptional (but that's typical in most Cascade made beers). Am not a big sour fan, but I could drink this all day (well, except for the 12% abv). Delicious stuff. T: Immediate lacto sting right upfront and perists from start to finish, Cascades signature move. This is followed by a big sweetness, Rum all the way. Bourbon and wood come to play shortly after and vinous taste and texture come to mind. An array of darker fruits. Bottle brought by me to the tasting. Thanks me! A: Clear copper color with a descending offwhite head. N: Lactic acid, honey, rum, more lactic acid, sweet-tarts, cherry and some raspberry. Coconut is prevalent. This is definitely a Cascade sour from the get-go. T: Sour, but it's more balanced with the underlying layer of sweetness than some of its counterparts. Not to say it avoids the sweet-tart thing, entirely. However, there's some aspirin and butter going on here. O: It's fun. It doesn't break any new ground, and it's not particularly memorable. I wouldn't turn down a pour, either. Thanks for sharing this with me, smarcoly! Dark amber and near-copper in color. Small ring of small khaki bubbles. Leaves dots of stick down the glass. A very sweet aroma, with definite rum barrel character, some vinegar and lactic sour character, very similar to many of Cascade's soured bottle offerings. There's some interesting fruit notes as well as some burnt sugars. A bit of alcohol as well. The flavor is both sweeter and more layered and complex than a lot of Cascade's bottled sours. Rum and barrel are very prevalent, dark fruits, caramel and candy bar, and lots of sour character. A bit too sweet though to be that drinkable. Somewhat heavy and full in body for a beer of the style. Moderate carbonation and a little booze. Good, but a very rich, incredibly sweet sour ale from Cascade. Not entirely drinkable because of the alcohol presence and extreme sweetness. Too boozy for it's own good, in my opinion, but still an impressive sour ale from Cascade.